Whether you’re looking for a pre-workout boost, a post-exercise recovery aid, or a nutritious snack, the Herbalife24 ACHIEVE Protein Bar delivers plenty of protein to help reach your goals. Available in Chocolate Chip Cookie Dough and Dark Chocolate Brownie flavours, ACHIEVE Protein Bars are a delicious way to fuel your next adventure. 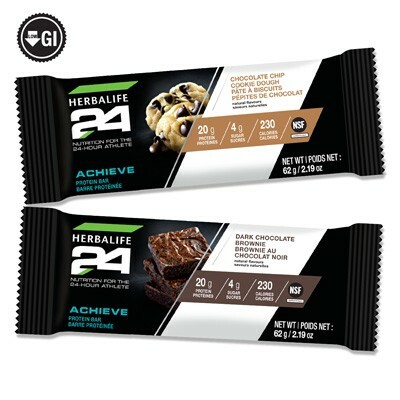 Consume 1-2 bars daily between meals, around workouts, or when your cravings hit for an indulgent, satisfying snack with protein-packed energy.